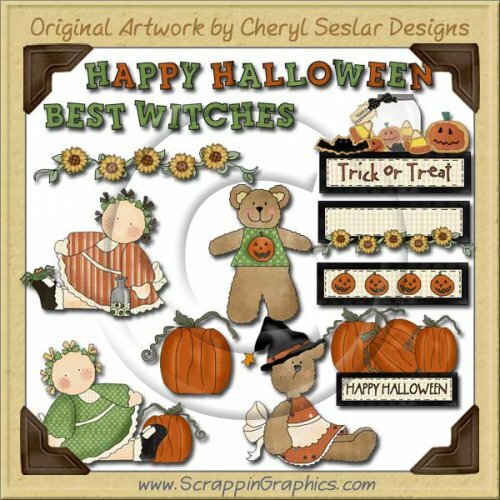 This collection of these adorable, charming graphics is perfect for all your Halloween projects. This set includes 12 different Halloween and Fall graphics: little girl sitting with pumpkin, sunflower border/divider, large pumpkin, girl with spider and jar of eyes, pumpkin banner/tag, teddy bear witch, teddy bear with pumpkin shirt, sunflower tag/banner, Trick or Treat banner, Happy Halloween banner, Happy Halloween & Best Witches word art. Great collection for making scrapbook pages, cards, labels, tags, invitations, and other printables.